The Sunshine Optimist Club was developed within a developmental disability agency, Independent Living Services, in Conway, Arkansas. Its purpose is to help students and their families be better prepared for life after high school. By working through the Optimist Club, parents and children establish different relationships than that of caregiver and child and together they make informed decisions about moving forward to an independent lifestyle. For some parents, knowing that there is a social, emotional, and professional network available to their child makes it easier for them to let go. As members of an Optimist Club, the young adults get to perform community service with peers and build relationships with others outside of the immediate circle of friends. While this model is still new, and I'm not aware of any other groups that have tried this option, one thing is certain, Optimist Club members from all walks of life enjoy performing one act together. 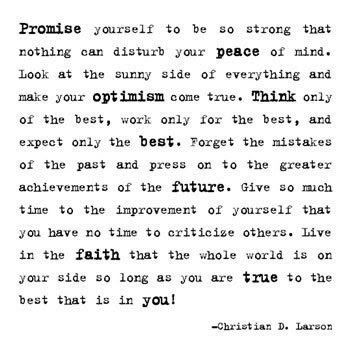 That act is shown in this video as the Sunshine Optimist Club recites the Optimist Creed. Please watch, and don't be afraid to join in. What does a bike safety day look like? That's a question that I've been asked more than once and I'm almost embarrassed to describe the minimal amount of work that can go into making one a success. Find some volunteers, set up some safety cones, add in kids on bikes, and teach them how to be safe when they are riding, especially in traffic. Of course wearing a helmet is de rigueur, so check to be sure the helmets of your participants fit properly. The good news is that police departments and fire departments love this type of activity and with proper notice most will get involved with your Optimist Club to provide this service to the community. Involving others is then up to your imagination! What would make the day fun for all? The Huron Valley Optimist Club and the Friends of White Lake Library recently combined their vision and imagination to host a Bike Fest and Safety Day. Watch the 2-minute video and see what they brought to life for their community and then go ahead, give it a try in yours. Huron Valley Optimists and Friends of White Lake Library - BikeFest and Family Safety Day 2013 from Huron Valley Schools on Vimeo. Homer's Heroes are some very special baseball players in Lincoln, Nebraska. Coordinated by the Lincoln Optimist Club, this program allows kids, ages 5-17, with special needs and varying disabilities to meet-up six times in the summer for their swing at America's favorite past-time. According to Jeanne Cuda, Homer's Heroes Chairperson, the program has been around since 1992. It started with twenty participants and this year there were more than 100. She described what a recent practice day was like by saying, "Often we'll have tears from the parents. They've been working so hard to teach their child how to throw a ball and it's a wonderful thing to see." Watch this great video by Dave Polzin, reporter with Channel 10/11 - KOLN-TV and you'll see just how special this "League of Their Own" can be. The Midtown Optimist Club in Independence, Missouri supported the Optimist International Childhood Cancer Campaign today by hosting a car show. Better yet, the proceeds from the annual event will benefit one particular three-year-old resident of their community: Gabriel Huffman. Watch to learn more. The Childhood Cancer Campaign was started to help eradicate childhood cancers through research at Johns Hopkins University. Over the years, meeting the needs of individuals has become equally important to members in local Optimist Clubs. To that end, specific fundraisers are held in communities across the US that stay right at home to help families as they care for loved ones stricken with cancer. Throughout the 2012-2013 school year, the Morning Optimist Club of Moreno Valley, California solicited donations from the community to purchase varsity jackets for student athletes who could not otherwise afford them at Moreno Valley High School. Donations came from businesses and residents and enough was raised to purchase 18 jackets this year. Fundraising will continue to do the same for next year's student athletes. For the student to receive a jacket, they had to maintain a 2.75 GPA. Shown here are the first six recipients. Their GPAs ranged from 3.66 to 4.7. Great job on and off the field! Photo courtesy of George Price, President, Moreno Valley Optimist Club. KVCR, the public radio station for the Inland Empire, California, recently featured the Riverside Optimist Club as the topic for the I.E. Scene. Connecting the Optimist Club with their audience extends the vision of KVCR to bring communities together. For the Optimist Club, it gets them a little publicity for the scholarship programs they provide to the deserving youths in the community. Watch it online here: Riverside Optimist Club. The Optimist Club of Fort Wayne, Indiana and the Fort Wayne Parks & Recreation Department collaborated on a Respect for Law Program. 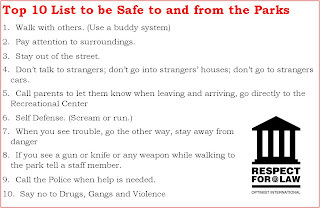 By surveying students involved with the Parks Department's Youth Centers, they created a youth-directed safety program designed with the specific intent of keeping people safe when they are in the parks or on there way to and from park activities. Don’t talk to strangers; don’t go into strangers’ houses; don’t go to strangers cars. If you see a gun or knife or any weapon while walking to the park tell a staff member. Call the Police when help is needed. Additionally, the Optimist Club has arranged for three forums where Fort Wayne law enforcement officers will make presentations and engage with the youth on a one-to-one basis. The Optimist International Respect for Law program was first designed to provide opportunities for children and law enforcement officers to meet in a non-threatening way and develop positive relationships. Over the years it has expanded to include officer recognition on a club and community level; but as with most Optimist Club programs, engaging our youth is always the most rewarding. Good job Fort Wayne! My home Optimist Club in Jerome, Idaho hosts a special needs fishing derby every year. It is scheduled on a school day so that transportation can be provided by the school district. With it being a weekday and several hours away from where I work, I usually don't get to attend; but I am so appreciative of my friends, loyal Optimist Club members, and the community for stepping up to this important and empowering activity. The pictures always show the pure joy, wonder, and accomplishment of the fishermen and women and I get a little giddy in their happiness. Today, on Father's Day, Steve Skodak, Executive Director of the Optimist International Foundation shared his own fishing story via a newsletter to Optimist Club members and Optimist International Foundation donors. Father's Day seems like a perfect time to share a fishing story; don't you agree? My heart was warmed even more to see his fishing story was about a special needs fishing derby with his home club in St. Charles, Missouri. 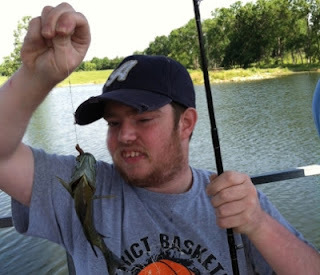 Unlike me, he was able to attend and he snapped this great picture of his fishing buddy for the day, Alex. Steve explained in his note that the local Optimist Club provided baited poles, angling lessons, buddies to fish with, and lunch. There were awards for the biggest fish, smallest fish, and most fish caught, among other things. Steve wrote, "Everyone went home with a medallion around their neck, a full tummy and memories of the 'big one' that got away." But it's his next line that makes every Optimist Club member do what they do time and again. Steve reported, "Each of us went away with something more amazing than a trophy or medallion. Remembering Alex’s face as he reeled in a fish will make me grin for some time." Steve, thanks for sharing your optimism and your story. It made me grin too and I hazard to guess that it will make others grin as well. Photo courtesy of Steve Skodak. 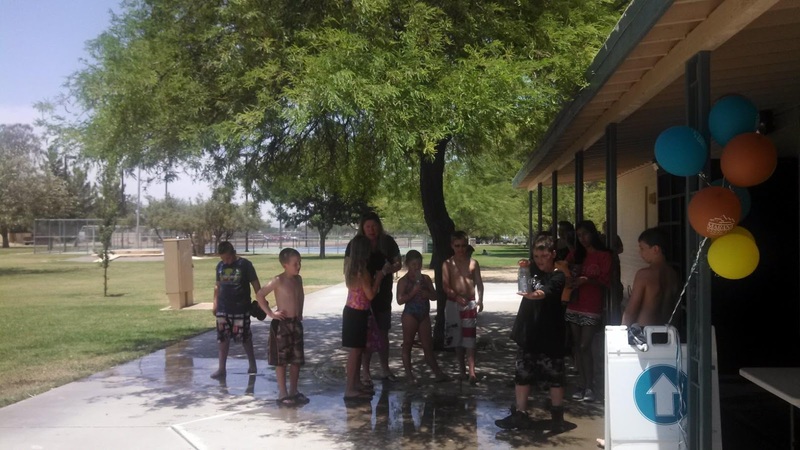 The Foothills Optimist Club of Tucson has donated more than $15,000 to the youth swimming program with the Marana Parks and Recreation District. Their giving continued yesterday, June 13, 2013, when they gave away 100 summer swim passes to area youths. 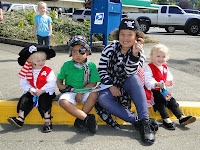 The kids began lining up early for a chance to claim their ticket to summer fun. The award was made official with a presentation to Mayor Ed Honea. But the Foothills Optimist Club's support of swimming and the children of the Tucson area doesn't stop there. 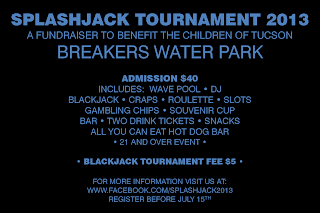 On July 20, 2013, the club will return for a fund raiser at Breakers Water Park. For a donation, adults can participate in an evening of dancing, gambling, and yes, swimming, should they so choose. 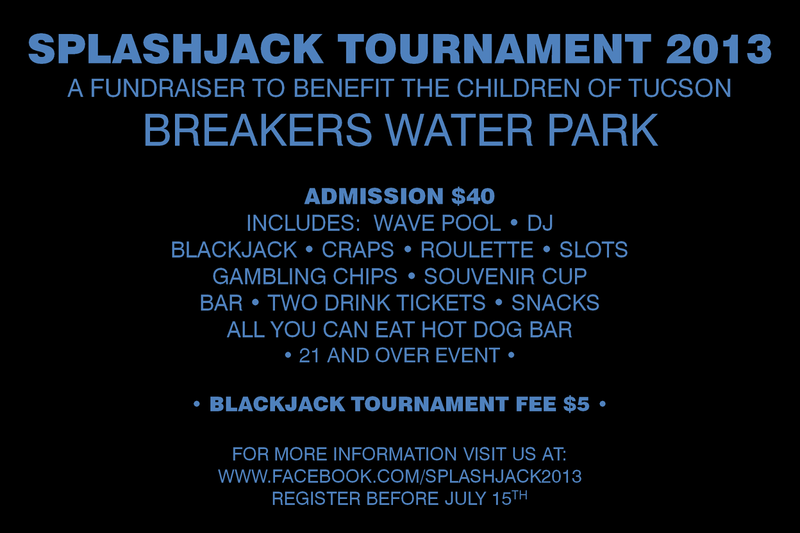 Find out more and register here to attend Splashjack Tournament 2013. I think this sounds like fun. Perhaps a trip to Tucson is needed! 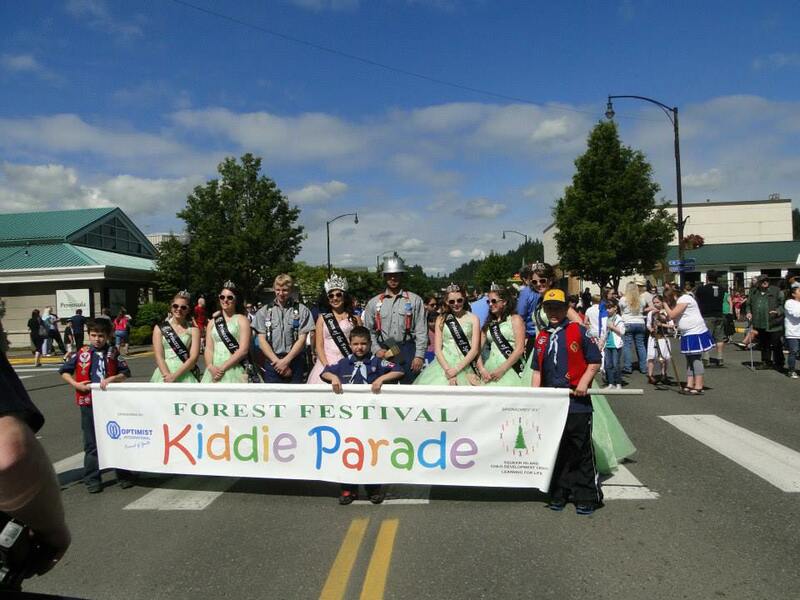 The Optimist Club of Mason County, Washington recently participated in the annual Forest Festival celebration. The festival recognizes the logging heritage of the area, gives a nod to Paul Bunyan and encourages sustainable uses of our forests. It also serves as one of the biggest community events, giving residents a fun weekend to share with their families and friends. 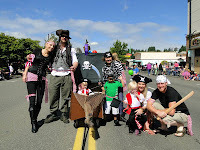 The Mason County Optimist Club produced and coordinated the annual Kiddie and Pet Parade, a precursor to the larger than life Paul Bunyan parade that takes place later in the day. 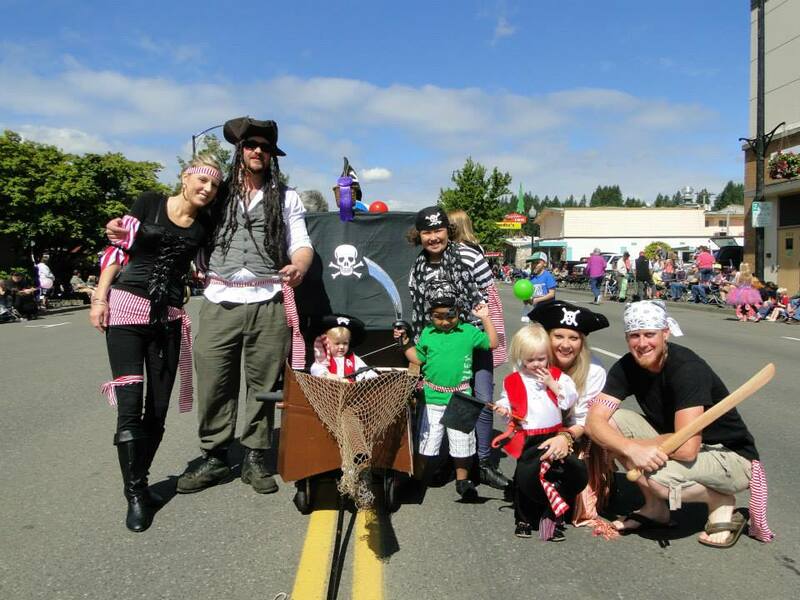 The theme this year was fairy tales and there were Paul Bunyan look-alikes, medieval warriors and princesses, and my favorite, pirates! As you can see, this whole family got in the spirit, but I have to say, my favorite pirates are the ones in the bottom photo - all four of them! Good job Mason County. Thank you for sharing your photos. See more on Facebook at the Mason County Forest Festival Parade. Youths giving back to the Optimist Club, an organization dedicated to providing programs that benefit, recognize or involve children, must be on the upswing. This time it was Cohen Dunn in Arnprior, Ontario. Cohen is participating in the "Who is Nobody" character education program at St. Joseph Academy. Among other things, the program helps children apply their own personal interests and abilities to provide service to a group or project in the community or world. Because of their youth-oriented mission, Cohen chose to give back to the Arnprior Optimist Club. He held a yard sale and gave $131.25 to the Optimist Club. 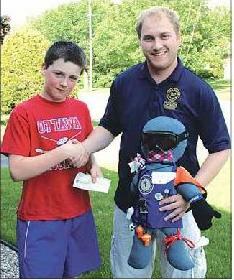 Cohen is shown making the contribution to Optimist Club president Brad McKay. Thanks for your consideration Cohen! As adults, Gen X and Baby Boomers especially, we wonder what is on the mind of the millennial generation? I say it's not all that different from things we thought about when we were their age: school, friends, enjoying the summer, and enjoying life. Career planning and social good make occasional appearances, but mostly, I think, they wonder about love. Will they find it? Will they do all they want to do before it changes their path forever? Will it matter? Thanks to my millennial generation niece, I share this video with you today. "When Love Arrives," is a sample of what I think young adults think about more frequently than they admit. It's a poem about the expectations and realities of love written and performed by Sarah Kay and Phil Kay. According to my niece, this poem is hopeful and wonderful in every way. This old-timer agrees that it is pretty cool. Enjoy.